With the start of spring, there one thing New Englanders always look forward to: warmer weather. And if you’re a runner, that means the end of treadmill season! As the Boston Marathon approaches, many runners will be pushing themselves to hit the pavement and squeeze in those extra training miles. 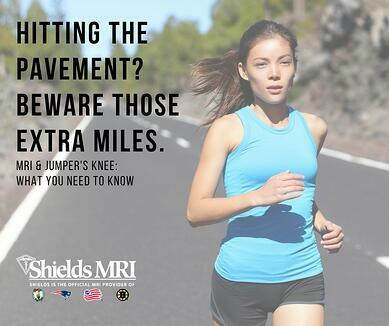 This may seem like a good idea, but you could be setting yourself up for one of the most common runner’s injuries: patellar tendonitis, or “jumper’s knee”. Patellar tendinitis is a degenerative condition affecting the patellar tendon within the knee. The patellar tendon is responsible for connecting the kneecap (patella) to the shinbone and allows the extension and straightening of the leg. It is most commonly seen in athletes that engage in repetitive, high impact activities- hence the nickname, “jumper’s knee”. This type of chronic overuse causes microscopic tears that weaken and thicken the tendon (patellar tendinopathy). Symptoms of patellar tendonitis, or “jumper’s knee”, often include pain localized below the knee cap during activity, aching, stiffness in the morning, perceived swelling or fullness, and a sensation of weakness or “giving way”. Shields MRI radiologist, Dr. Ketan Patel, specializes in musculoskeletal and orthopedic MRI and has scanned many patients who suffer from this injury. Dr. Patel advises that the most defining characteristic of jumper’s knee is pain and tenderness of the patellar tendon, especially with resisted extension. This means that your physician will likely test the strength of your knee through a variety of exercises, including several where they will apply pressure to your leg/knee as you attempt to extend the leg outward. Pain in this situation may be indicative of patellar tendinitis. There are a variety of imaging modalities that may be used to diagnose “jumper’s knee”. 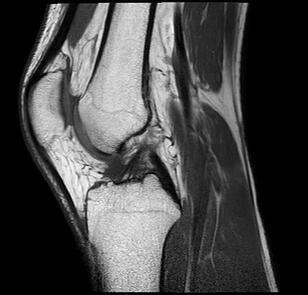 Dr. Patel advises three common methods for the diagnosis of patellar tendonitis: X-Ray, Ultrasounds, and MRI. An X-Ray can be used to help determine if there is swelling in the region of the patellar tendon. Both Ultrasound and MRI will show any thickening or tears to the patellar tendon, however, according to Dr. Patel, “ultrasound is most useful to gauge the extent of tendon and for a quick look.” MRI is most useful to gauge severity of the injury. What are the benefits of MRI for Jumper’s Knee? An MRI will help to identify the severity of the injury and whether it is thickening of the tendon (patellar tendinopathy), minor tears, or a complete tear. Depending on what the MRI shows, treatment and recovery plans will vary. 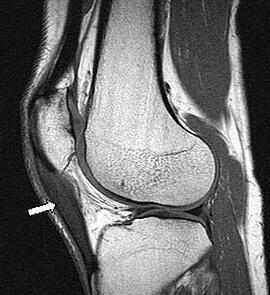 Another benefit of MRI is to “rule out” other common injuries that share similar symptoms to “jumper’s knee”. Other common knee injuries include transient patellar dislocation, patellar fracture patellofemoral syndrome, bursitis, medial plica syndrome, Hoffa's disease: inflammation of Hoffa fat, osteochondral defect, or a meniscal tear. Through his experience reading orthopedic MRIs, Dr. Patel commonly see’s “jumper’s knee” confused with a condition called, patellar sleeve avulsion. Though both are knee injuries with similar symptoms, patellar sleeve avulsion is an injury to the knee that is “usually (caused by) a single traumatic event rather than chronic micro trauma”. Other risk factors may include muscle tightness that causes strain to the tendon, as well as muscular imbalance. If some muscles within the leg are stronger than others, they can potentially cause excessive pulling to the tendon, which may also lead to tendonitis. Dr. Laurie Katz typically recommends “rest, anti-inflammatories, and physical therapy” for initial treatment of patellar tendonitis. Proper rest is critical for the tendon to adequately heal enough for future exercise. This often means taking a break from physical activities, such as running, all together. Dr. Patel suggests the typical timeline for recovery to be roughly 12-18 months. However, symptoms may persist in select cases. Continued activity and stress to the area will delay recovery time and cause further damage to the tendon. In instances of a complete tear, surgery will be required to repair the tendon. It’s important to know that every injury and athlete are unique and the findings from the MRI combined with the recommendation from your physician, will determine the right treatment plan for you. What will an MRI cost for Patellar Tendonitis?